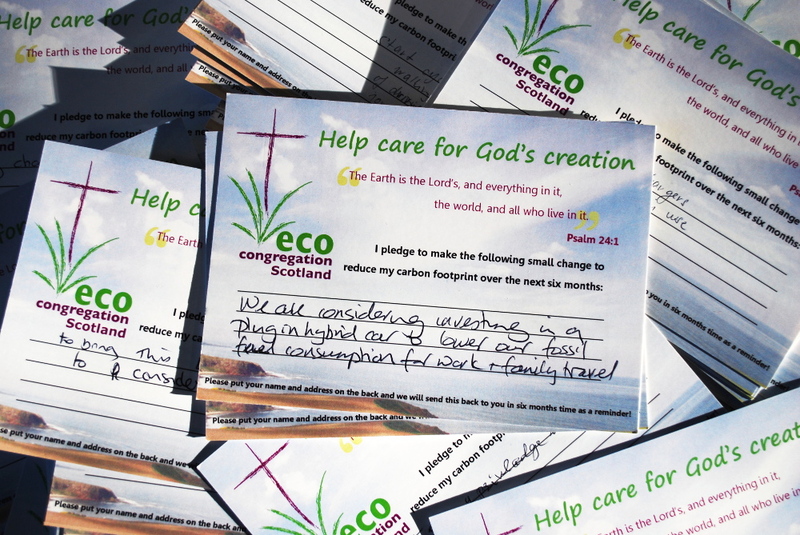 All Eco-Congregation Scotland resources may be freely copied and distributed within your church, but please credit Eco-Congregation Scotland. We produce a monthly email newsletter. To sign up to receive the newsletter please click here. To read previous issues please click here. For an article about Eco-Congregation Scotland for inclusion in your church magazine please click here. These are in PDF format for viewing, printing or emailing. If you would like printed copies please contact us. A folded leaflet which explains our aims and objectives and includes a registration form for congregations. An A5 flyer for use at events and for other purposes. Environmentally-friendly pledge ideas; we also have postcards which can be ordered from us to use as pledge cards which you post back to congregation members after a certain amount of time. Our Annual Report and Accounts from 2010 onwards can be found here. The Report 2003-2006 (.pdf, 4MB) is full of pictures, stories from churches, and information about the programme nationally and locally between 2003 and 2006. Powerpoint Presentation (.ppt, 2.0 MB) complete with notes, introducing the programme and giving stories of what other churches have done. You could use this to introduce your church congregation or church decision-making body to Eco-Congregation. Alternatively, the slides may be printed out and used as a display about the programme.